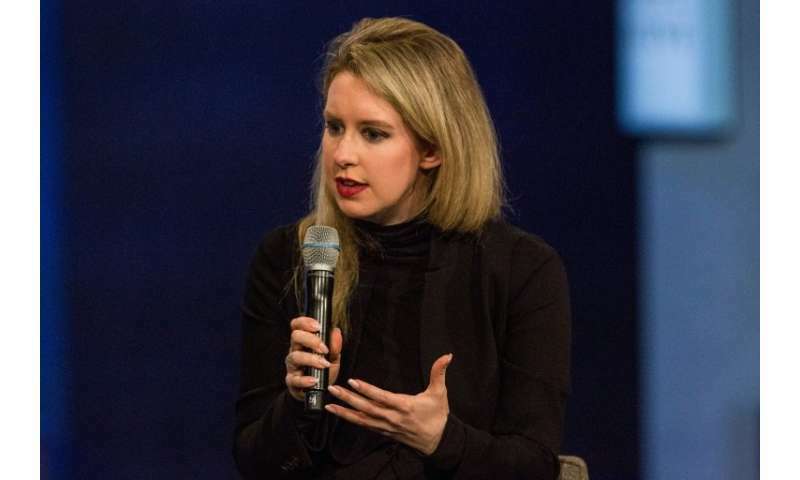 Elizabeth Holmes, the founder of blood-testing startup Theranos and a onetime Silicon Valley star, has been hit with criminal charges accusing her of defrauding investors and others, prosecutors announced Friday. The Justice Department said a federal grand jury in California indicted Holmes, 34, and Ramesh "Sunny" Balwani, 53, who had been president and chief operating officer. The indictment claims that Holmes and Balwani falsely claimed that they had developed revolutionary technology that could quickly provide a range of clinical tests from a small drop of blood. "Today's indictment alleges that through their company, Theranos, CEO Elizabeth Holmes and COO Sunny Balwani not only defrauded investors, but also consumers who trusted and relied upon their allegedly-revolutionary blood-testing technology," acting US Attorney Alex Tse said in a statement. The wire fraud and conspiracy charges could lead to prison terms up to 20 years and fines up to $250,000 if they are convicted. The indictment says the fraud caused hundreds of patients or their insurers to pay for blood tests and test results, sometimes following referrals from their defrauded doctors. "In addition, the defendants delivered to doctors and patients blood results that were inaccurate, unreliable and improperly validated," according to a statement from Tse's office. Theranos was founded in 2003 by Holmes when she was only 19. She became a media darling, attracting millions of dollars in investment based on claims of innovative technology. But Theranos came under scrutiny after The Wall Street Journal published articles questioning its claims. In March, US securities regulators accused the youthful entrepreneur of an "elaborate, years-long fraud." Theranos said separately that Holmes has been replaced as chief executive. A statement by the board of the California startup said only that Holmes "has stepped down as chief executive officer" and that David Taylor, the company's general counsel, has been appointed CEO. "Ms Holmes remains with the company as founder and chair of the board," the statement said. Holmes was seen for a time as a rising star in Silicon Valley, appearing at events like the Women In Technology and Politics dinner hosted by Glamour and Facebook, the Vanity Fair New Establishment Summit and events hosted by the Wall Street Journal and TechCrunch. She and Balwani pitched a tale in investor presentations, product demonstrations and media articles about the startup's key product—a portable blood analyzer—which they claimed could revolutionize the industry by inexpensively conducting comprehensive tests from drops of blood from fingers. Is Theranos a tech revolution in healthcare or marketing hype cloaked in secrecy? Who says successful psychopaths cant be women? ""A lot of the same characteristics you see in very successful CEOs—fearless dominance and boldness—are the same you see in Presidents and psychopaths," said Dr. Michael Woodworth. "Take the young and brilliant CEO of Theranos, Elizabeth Holmes... In 2015, The Wall Street Journal exposed that the entire thing was a scam. As the story goes, Holmes was willing to risk people's health (and lives) to make her company more successful. So, did her personality get her ahead in business? Yes. But did her success come at an extreme cost to others? Sounds like a lack of empathy to me."